Every few weeks I devote a blog to the Blue Dog Story, from its loup-garou beginning in 1984, and on to Tiffany, Absolut and Xerox, Blue Dog Man, Sculptures, Red Dog, and Silkscreens. I last wrote about the Abstract Paintings of 2001-2003, and I’m a bit lost as to how to move forward. To assess something, to re-cap it, that thing has to have passed, along with enough time following it to study the phenomenon in a context. I’m just not sure we’re there yet. By 2003 George Rodrigue was devoted to the series Bodies, a contemporary expression of Jolie Blonde. This consumed him for more than two years until August 2005, when Katrina hit, disrupting (as it did for thousands) not only his external world, but also his internal creative one. In fact, that weekend of August 29, we (the entire gallery staff) were in Houston for a Bodies exhibition. 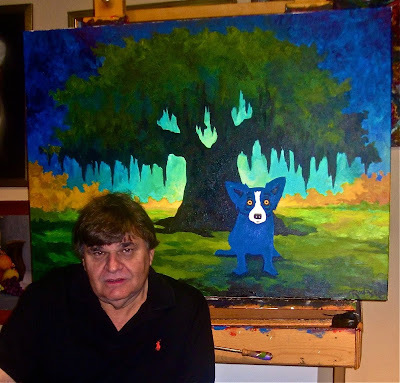 It was months before George returned to his easel, and once he did, his main artistic focus for the next two years was Blue Dog Relief, a series of silkscreen prints benefiting the arts, education, and humanitarian needs of South Louisiana (an in-depth blog better saved, I feel, for late summer). By 2007, although he was painting again, it wasn’t with his pre-Katrina focus. George likes to paint in large blocks of time ---- three to four months at his Carmel studio easel, and we just couldn’t make it happen. (This year, for the first time since before the storm, he’ll spend four near-consecutive months in his studio, an artistic immersion I look forward to sharing with you this summer). A flurry of museums and other venues contacted George for exhibitions just following Katrina, and so for three years beginning early 2007 we mounted large scale retrospective shows at the Dixon Gallery and Gardens Museum in Memphis, Tennessee (150 works, 2007), the New Orleans Museum of Art (260 works, 2008), and both the Acadiana Center for the Arts and the University Art Museum in Lafayette, Louisiana (150 works, 2009), plus smaller exhibitions at several Louisiana State Museum venues, the Coral Springs Museum of Art in Coral Springs, Florida, and Amuse Bouche Winery in Napa, California. After eighteen years in the same location, we moved our Carmel gallery in January 2009 to a new space, doubling its size, and in August 2009 we purchased a two hundred year old building in the French Quarter where we’ll move the New Orleans gallery in the coming weeks. Throughout all of this, George painted intermittently at his easel, designed and built a 28-foot public sculpture (nearly a year in the making) for Metairie, Louisiana (a suburb of New Orleans), and spent six months on a project for the National World War II Museum. George, Help. What are your thoughts today with the Blue Dog paintings? “I can’t think about today without looking back at my art career of forty years. It all boils down to that first decision. There I was in art school in Los Angeles facing choices about art, art teachers, art schools, art business, commercial art business, advertising business --- all paths I could have gone down. Yet I chose to be a painter, an artist that basically has to sell his paintings to make a living. The first thing I realized after seeing the Warhol exhibit and seeing what my teachers were doing at different galleries, was that an artist has to have a lot of guts and do things and take chances that might not make sense to the art world at the time. There was a risk factor that was very prevalent in everything I saw. Warhol risked painting Soup Cans and Brillo Boxes and called it art. At the same time, most of my art teachers in California were painting hard edge and ‘feel’ paintings (pure color), a direct reaction to non-easel paintings, such as Jackson Pollock and his drips, or other popular trends like painting on the floor, taping off canvases, and creating big flat areas of color. “My decision to leave the contemporary art field and move back to Louisiana, painting something from the past with contemporary eyes, to me, took guts --- rather than painting the abstract expressionism going on at the ‘academic’ or what some called the ‘high art’ level, such as it was, in my state (certainly at the universities), or for that matter, permeating the country. “That also took guts, in a big way. I took a giant leap into the future. I can’t tell you how many people told me I was crazy, I was stupid, I would ruin my art career. Why would I paint this when my Cajun paintings were selling and I made a good living? “The only thing I knew I was going to do next was to make it better and do something that no artist has ever done to this degree --- pick one particular object and grow with it. Don’t get me wrong, there were others…. Jasper Johns with his targets, Robert Indiana with love and numbers, and the list goes on, but their art didn’t develop through changes within that one image over twenty-five years. So where is the Blue Dog today? "Today I think the Blue Dog is probably a comment on, well, the Blue Dog. The art looks back at itself and in doing so creates a future. The dog looks at itself to find a new direction. It’s hard to explain in words (laughing) --- it's much easier on canvas! I still don’t know, really, what I’m going to paint when I sit at my easel. I’m still on a path looking back at the imagery and also moving forward, translating both my past and my new ideas into a different, exciting future. So the new gallery space influences your work? “That, and the reactions of the people walking by and peeping in the windows. I get excited to see the public excited! They’ve expressed awe over these large expressions on big walls, many canvases with massive antique frames that strangely compliment these giant graphics, these swaths of bold color, with the theme of the Blue Dog. Wendy - You never cease to amaze Brooke & I with the ease and fluidity in which you describe your incredible life with George and his limitless ingenious. Inspirational to say the least! The new painting looks "wonderful & happy!" What a Louisiana treasure! I love Blue Dog! It makes a heart happy to look at these wonderful paintings! I hope to have one hanging in my home one day! It is just everything good and southern in this world! Thank you for sharing these great stories and to George-thank you for sharing this God-given gift of your art! I think Pantone needs a color called Blue Dog Blue.